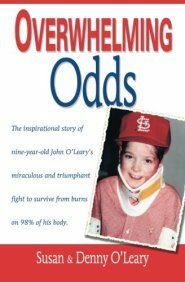 In 1987, John O'Leary was a curious nine-year-old boy. Playing with fire and gasoline, John created a massive explosion in his home and was burned on 100% of his body. He was given a 1% chance to live. Our people are still talking about John and his message. John, keep doing what you're doing. It's your calling. I have helped put together national sales meetings for Stryker Biotech; we've had a variety of speakers. None had stories as compelling or personal as John's. I speak for the whole audience when I say that it was the most meaningful for all of us. John was by far the best speaker we have EVER had! John’s generosity and genuine caring manner were very apparent, allowing us to feel the significance of his speech. We are honored to have met him. Every person in the group had both a tear and a laugh. That is a hard combo!